I have been bad and have not touched a musical instrument since the beginning of the year. This week I ended that drought. A small level, I picked up my trumpet for the first time in ages and was surprised that I could still do pretty well with it. But more than that, I played the piano at least a little every day. Not a lot and nothing great. First, I have a few ditties I always play when the dogs eat – for a while they wouldn’t start eating until I started to play! But I also just played. Not really “practicing”, just going through a few songs and things and improvising a little. I won’t be giving a recital any time soon, but it was fun. A little side note – I have written before that I have a hard time keeping up on more than one art, so the deeper I am into writing, the harder it is for me to keep up with anything else. I have maybe 2,000 photos that I haven’t touched – it’s been over a year! And I haven’t written any new music since I did the real fast recording back for my Korg Arp review, and for that I literally just turned on the recorded and improvised. So it is nice that I am starting to get back into playing – I have a really hard time not having music in my life. That is my smile for the week, getting back into the groove of playing the piano after not playing for almost two months. Come on, I’m sure you smiled at least once last week. Why don’t you share it? I hope you can join in! Here is list of “rules” and guiding ideas. If you don’t have time to read it right now, just remember that this is an exercise to spread positivity. Don’t smile about the misfortune of others. Don’t smile in a way to excludes others. Make sure a 12 year old can read it. To join in, write a post to share your smile and then leave a comment on this post with a link to your smile. Or, if you prefer, do a pingback to this post (pingback = have a link from your post to this one). You can post any time until next Sunday evening (to be simple, I will say midnight GMT, which is 7 PM Sunday for me). Next week I will compile all of the Smiles and do a separate post of them on Monday morning just before the smile. (I will shoot for around 7 AM EST). 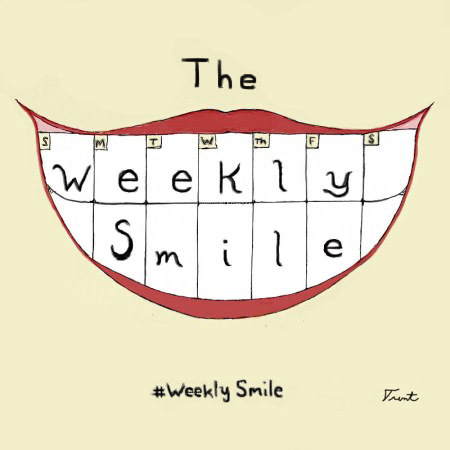 Try to use the hashtag #WeeklySmile when you use Twitter or other social media that uses hashtags. I searched Twitter and found that #weeklysmile had been used only a handful of times back in 2012 and 2013. It hasn’t been used since. So it’s ours! I also registered it on Twubs. You can use the graphic at the top. It is the official graphic for the event. This entry was posted in Smile and tagged #weeklysmile, piano, smile, weekly smile on February 25, 2019 by trentpmcd. I don’t watch TV and I don’t have a social life ;) Of course my blogging and writing go hand in hand – most of writing lately has been on the blog, though I spend even more time editing off line. A good smile this week Trent. As a person who plays no musical instrument, I always admire someone who is able to do so. Thanks, Colleen. I’ve played one instrument or another since I was seven, so it is almost a deep seated need by now. When I don’t play for a while, I get “itchy”. A good smile this week, Trent. :) You have prodded me into starting mosaics again. Not felt like/ could not walk to the workshop area since Dec. Now i’m, finally walking a bit I should get back into the groove! My smile this week was more of a giggle. I know what you mean. I used to play music professionally as well, but somehow with the writing and the ministry taking so much of my time and energy over the past decade, I haven’t spent more than a very few hours on music. It used to be what helped me relax, but since I’ve been dabbling in watercolor and it’s so relaxing, I’ve sort of substituted that. But every once in a while i look at my keyboard longingly and wish I had time to play. It’s almost always at a time when I’m on a deadline for something else, though, so it still gets put on hold. There are just too few hours in the day for everything… I think if you let yourself play a little without making promises or being disappointed that you can’t play like you used to, it might be possible, it’s just hard to get in a habit unless you make room for it. My hands won’t play anymore. I sold my piano. All it did was leave me frustrated. I’m sorry. I would hate to lose it. I’m not sure how much of that is genetic – hopefully since both of my parents (mid-80s) have little problems with arthritis it will skip me. I don’t want to be morbid, but that is why we lost Kieth Emerson – He had promised to do a tour and he couldn’t play any more. That his rival, Rick Wakeman, could still play as well as he did in the 70s most likely didn’t help. Keeping in touch with your music is important – which is way my wife and I started playing handbells 12+ years ago. It is important. When I’m not making music I start to sing constantly all day, and I’m terrible, so I think everyone is relieved when I start playing again ;) I’ve never tried handbells. If I am thinking of the right thing, it would force you to join a group of some type, which is often my problem – I pretty much do it as a solitary thing. I agree, make at least one person smile a day! It is true, Trent. If you work you only have time for one art. As I get deeper into writing I have less time for my fondant art. I still do make time for it though as I do enjoy it. I am glad you are finding a little time for the piano, I wish my older son would. Typically I can find some time for playing, if not actually composing, but lately not even that. I think it’s that you have to make a conscious decision to carve out time for it. Also having a routine is good – like playing when I feed the dogs. I hope you can continue with your fodant art. Oh Trent, I love this!! I play the piano too (just started lessons a few years ago), and I so appreciate how it could make you smile to resume playing. Have a great week. Happy Monday to you. Pingback: The Weekly Smile 2/25/2019 #weeklysmile | Tessa Can Do It! Positivity is Catching!